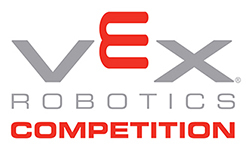 VEX competition team requirement: The team submitting the entry must be registered in the current season's VRC or VEX U program. No team may submit more than one entry, but each team in a multi-team school or club program may enter this competition. For example, teams 123A and 123B could each submit a video, but team 123A could not submit two videos. At the end of the video, there should be a credits section including the name of the entrant, the VRC team number of the team, and the name of the video. The credits should be no longer than 15 seconds (Total allowed video length is 105 seconds with credits included).